5.0 Newness now on the Wiki! Hey guys its a terrific Tuesday! What does that mean? Well its my connection day and I wanted to share something with all of you guys the hard work ive been doing on the wiki! All of these coats are pretty cool and remember everyone who got a new starter 5.0 has the chance to get one!! All of the above coat do have the ability to pass on! Now lets talk confection eyes! Yes thats right there were several new ones added to the list for those of you trying to make your own confection horse! You can check them all out here!!!! Now there were also 3 new brandings that came out in 5.0! I can’t wait to see what you guys do with those trend setters with these new beandings! 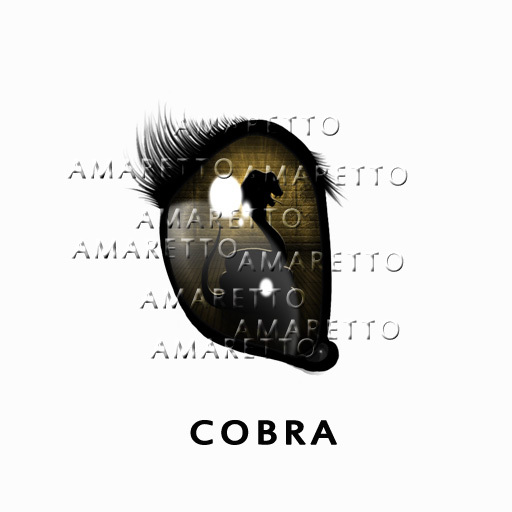 I know that most everyone has seen the newness that came from the 5.0 update, but did you see the new Cobra albino eye? Amaretto Albinos have become somewhat famous in the Amaretto Community. To have such a prized horse born is very exciting. Plus they come with a very special eye that will be sought after by many. Albinos come with very special Albino eyes that can be passed on to their offspring. The Albinos come randomly from full siblings. Full siblings are siblings that come from the exact same mother and father. Siblings do not have to have the same traits they only need to be full sibling. The Albino coat does NOT pass. However, breeding an Albino with another Albino does slightly increase your chance for another Albino. Well hope you guys like all the newness on the wiki this is Ava over and out! Happy breeding everyone! Is it a Zebra… Is it a Unicorn… It’s a Zebracorn!!!! Oh boy today is an exciting Saturday!! Not only is it Double Points day… but a brand new Haven Horse was released!! The amazing Zebracorn… and these beauties are like all the other haven horses, the coat does not pass, but the awesome eyes do have the ability to pass, but hold on…. 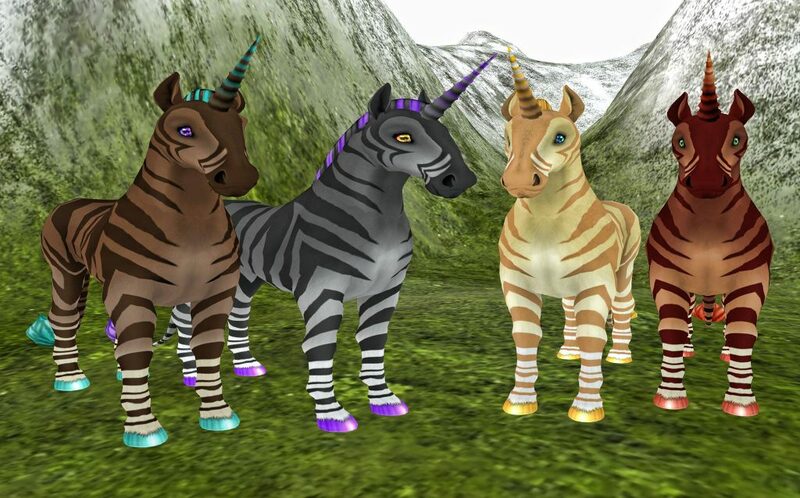 I’m not done yet… if you breed the new Zebracorn with any other horned horse (the horn must be shown in the stats) you can have a chance at one of the Zebracorn’s horn passing… oh oh but wait…. you may also have a chance at another hidden surprise! There are four Zebracorn colors that are random from the bundle and gender are random as well. The awesome Roach mane does have the ability to pass but the adorable Lion tail does not. So remember Double points until 11:59pm SLT Saturday September 27, there will be double points for horses, k-9’s and birds! So get those points ready and grab you a new Zebracorn! Ready for the next twist? For October we are combining the Clydesdale and the Andalusian!! From October 5th 2014 until November 5th 2014 you can breed any color Clydesdale and any color Andalusian together and you have the chance of discovering a brand new coat designed especially for the Twist called Clydalusian! Each will also come with a very cool twist eye that will pass as well as the coat. So just to be clear you need to breed one Clydesdale of any color and one Andalusian of any color together in order to have a chance at getting a Clydalusian! Our K9s want to twist along with the horses so from October 5th 2014 until November 5th 2014 If you breed any color Staffordshire Bull Terrier with any color Chihuahua you have the chance of discovering a brand new coat designed especially for the Twist called Staffuahua! Each will also come with a very cool twist eye and collar that will pass as well as the coat. So just to be clear you need to breed any color Staffordshire Bull Terrier with any color Chihuahua in order to have a chance at getting one of the brand new Staffuahua! Have fun twistin it up!! Today i wanted to go over to the Bird Sanctuary an tell you all about what you can get when you send a barnyard bird to sanctuary. First off you can click on your barnyard bird that has run out of cycles . You will need to do this , Click your Barnyard Bird, click settings, click Bird Sanctuary, then click yes. The number of Henny Pennies you received from the Barnyard Bird are posted in local chat. ONCE A Barnyard Bird IS SENT TO BIRD SANCTUARY IT IS UNRECOVERABLE ! Let take a trip to the haven sim or to any Amaretto Barnyard Bird store, and see what you can get with your henny pennies. Until next week Happy Breeding ! Happy Thursday Everyone! It’s that time of the week again, time for me to shine my spotlight! This week I want to shine that spotlight brightly on the newest K-9 Twist coats that I am absolutely obsessed with, the Danbull! These little K-9’s could not be any cuter if they tried! However, I am going to try to make them as cute as possible by adding pretty matching collars and eyes and noses and paw polish …. The works! 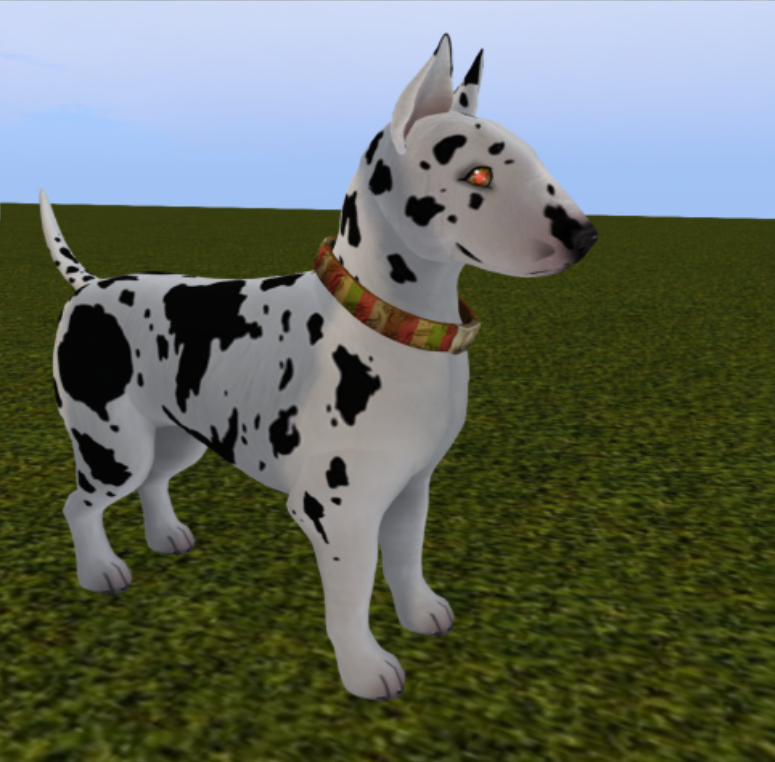 You still have the ability to get one of these gorgeous Danbull’s by breeding any color of English Bull Terrier with any color of Great Dane until October 5, 2014. 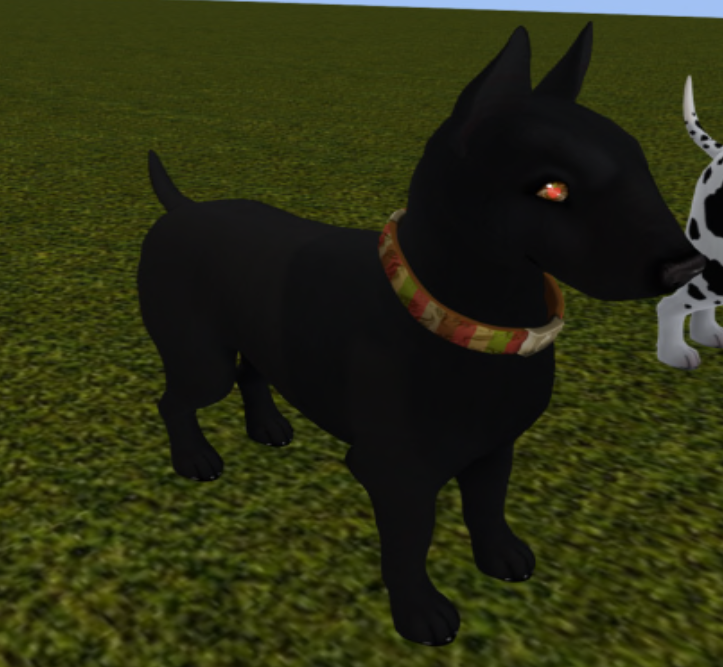 There are 4 different color Danbull’s that you could be lucky enough to receive, Black, Brindle, Fawn or Harlequin and they come with the very pretty Here Comes Fall eye and collar. I have included pictures of the Black and Harlequin Danbull’s below but if you wish to see them all you can click the link below to see pictures of all different colors. To say I want to collect them all is an understatement … I have to have them all! So be sure to watch for next month’s Twist to be announced and then get your K-9s ready to breed for the Twist each month because as you can see from the Danbull’s you just never know how darn cute the new Twist are going to be!! Until next time Happy Breeding!! 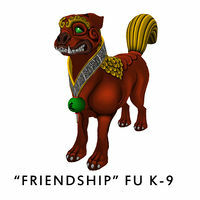 First off kennel Cash is what you get when you send your K-9 or kennel to Puppy Paradise. You have to accept to send a K-9/Kennel to Puppy Paradise, therefore it cannot be reversed. So make very sure this is something you really want to do. Even if it’s done by mistake it cannot be undone. So please be careful! 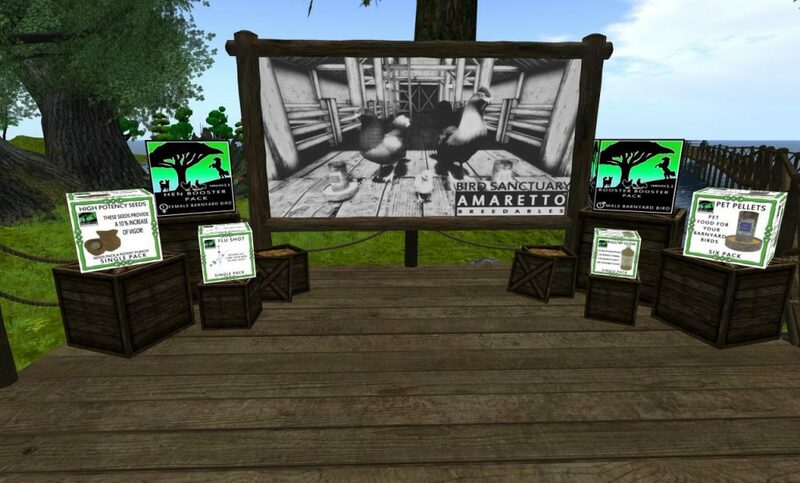 All of the Amaretto K-9 Stores have a Puppy Paradise Vendor, except the main sore as it is located next to the haven sim. If you wish to purchase an item, all you do is click on the board or box and you will receive a drop down menu asking you to confirm your purchase and the point cost. Once you confirm this purchase your order will be sent to you in world!! Again please remember:Before you send that K-9/Kennel to Puppy Paradise, make very sure this is something you really want to do. Even if it’s done by mistake it cannot be undone. So until next time, have a great week and Happy Breeding!! Let’s Take A Look At Horse Haven! Happy happy Monday Amaretto Community! Today I wanted to touch bases with you about Horse Haven! 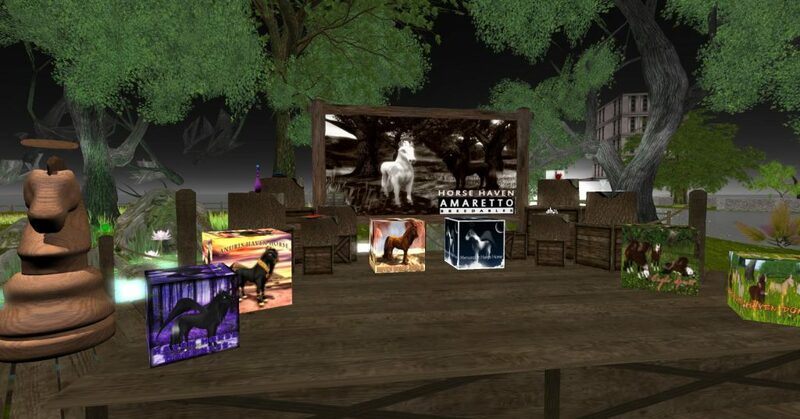 I wanted to give you some tips on sending an Amaretto Horse to Horse Haven, a list of traits and how many points you will get, and a list of items available through Horse Haven with your Haven points. First you are going to need to re-rez an Amaretto Breedable Horse if you just purchased it before you sent it to haven. This ensures that it is registered in your name under the server so you get the correct points to your account. Be sure to make sure your breedable is not sick. You can’t send a sick breedable to haven. Be sure you click the confirm button on the menu. If you send your horse to horse haven and in local it shows you that thehorse/bundle was indeed sent to haven and it just sits there on your land give it some time to see if it poofs if it doesn’t, you can just delete it because it has shown you in local that you received the points. Also you can re-rez the breedable and it will indeed tell you that it was sent to haven, puppy paradise, or bird sanctuary. Simply go to the any of our store locations and find the Horse Haven Vendor, Click the start button on the bottom right of the vendor. Your current amount of Horse Cents will be displayed in local chat. After clicking the Start button and reviewing your Horse Cents balance you have 60 seconds of reserved time to make a selection from the vendor. Once you have made your selection you will need to agree to spending that many points on that item. If you agree you will then receive your item from the vendor and the Horse Cents will be deducted from your Horse Haven account. To make another purchase simply do it again. I hope this helps everyone understand Horse haven and all it has to offer!! Happy Breeding and Horse Havening! Hey everyone! Today is a lazy Sunday for me hope it is for you as well! With all the excitement of the new hiddens coming out of the starters I wanted to take a moment to highlight our brand new Charmed Horse!!! Thats right there is a new Charmed Horse on the grid! 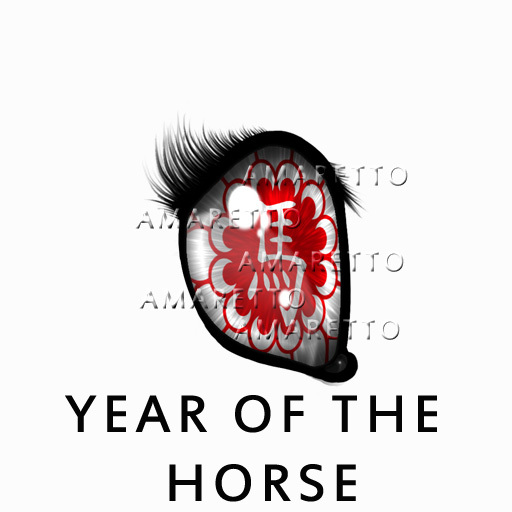 Introducing to you Charmed Year of the Horse! 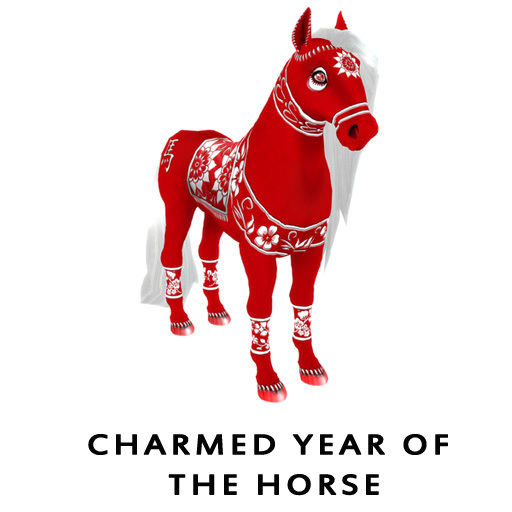 When the version 5.0 Horse update came out on September 3, 2014 the ability to receive this exciting new Charmed Year of the Horse was also added! Charmed Horses are very special horses that can be born at random from ANY horse breeding combination. Charmed Horses are NOT able to pass their coats. However, you could get extremely lucky and birth another Charmed Horse. When you breed a Charmed Horse (whether it is with another Charmed Horse or any other horse) you DO have an increased chance at receiving another random Charmed Horse. The non-Charmed offspring of Charmed Horses do NOT have an increased chance of producing Charmed Horses. Take a look at this beauty!!! Remember everyone has a chance at getting a charmed horse so good luck out there and happy breeding! This is Ava over and out! Happy Friday Everyone ! Hope everyone is having a good breeding day ! 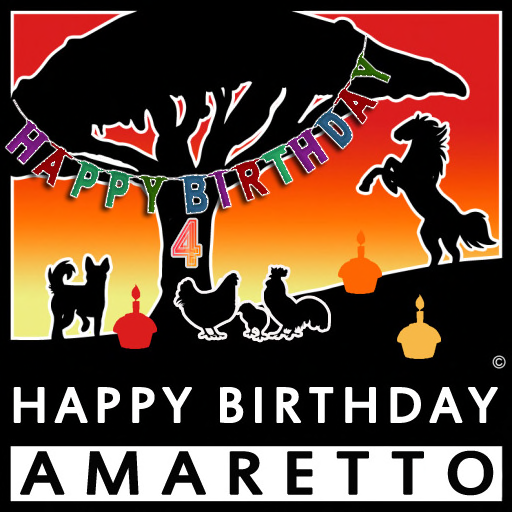 Today I wanted to share with you 2 videos that were taken from the Amaretto 4th Birthday Luau. The Party was a blast ! Amaretto wants to thank the community for making it a success. Look for yourself in the following videos if you were able to attend! The first video was produced by AviewTv big shout out to the the AviewTv team! 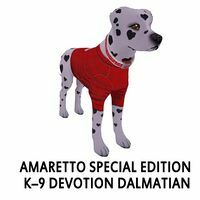 Amaretto would like to thank Foxie Dinzeo for sharing this you tube video with all of us! Happy Thursday Everyone! Today’s Spotlight I want to shine brightly on the Mandatory 5.0 Horse Update Deadline. While it seems like the 5.0 update just came out yesterday it was in fact 2 weeks ago that the 5.0 Update hit the grid. We told you in the update notecards that accompanied the updaters that this was in fact a Mandatory update and that horses needed to be updated by the 19th of September in order to continue receiving viable bundles. So that means there are only a few hours left for you to get all your horses updated to Version 5.0 because at midnight tonight they will stop dropping viable bundles. Below I have copied the text from those notecards as a reminder. With v5.0, Amaretto has implemented all new food and consumables that have safety protocols. This was done to protect Amaretto as well as the community. Because of these new safety protocols, update v5.0 is MANDATORY. Horses will no longer function properly if they are not updated to v5.0 by September 19, 2014. 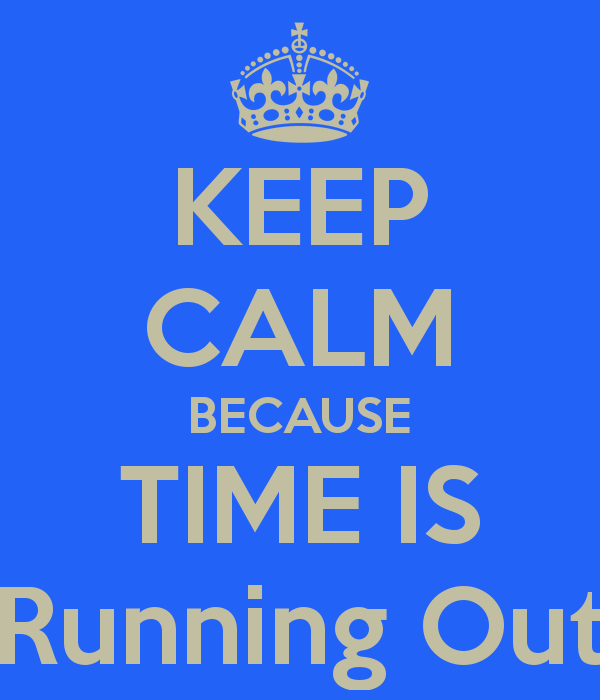 After September 19, 2014 Older version horses WILL NOT have a viable bundle!! Beginning September 19, 2014 ALL versions that are not v5.0 will no longer produce viable offspring. Meaning any bundle produced on or after September 19, 2014 by all versions that are not v5.0 by September 19, 2014, will have the text BAD_DATA_NO_PARENTS and will not birth. If you receive a bundle like this it cannot be fixed. So beginning at the stroke of Midnight tonight the 4.0 and older horses will no longer produce a viable bundle and filing a ticket will not be able to fix this. The only fix for this is for you to update your horses to Version 5.0 (this deadline is only for live horses you may update your bundles at any time you chose). I hope you are all enjoying the new things being discovered with the 5.0 Horse Update and until next time….. Happy Breeding! !